KATHRYN I. (BRUCE) REEVES, age 97 of Tabor, IA, died Monday, January 14, 2019 at Linnwood Estates in Glenwood, IA following a brief illness. Kathryn was born October 6, 1921 in Glenwood, IA to John Peter Bruce and Nellie Bernice (Russell) Bruce. 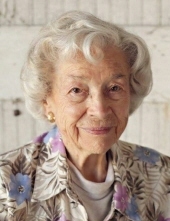 On April 25, 1941 she was married to Albert Evan Reeves in Platte City, MO. She was a member of the Congregational United Church of Christ in Tabor, IA. Kathryn was preceded in death by her parents; husband, Albert Reeves; 2 sisters, Frances Hansen and Norma Green; and a brother Jack Bruce. She is survived by her daughter, Sharon Wietzki and husband Dan of Tabor, IA; 2 sons, Jon Reeves and wife Paula of Silver City, IA and Tracy Reeves and wife Wendy of Glenwood, IA; 9 grandchildren, 14 great grandchildren; brother, Donny Bruce and wife Diane of Glenwood; numerous nieces, other relatives and friends. Funeral services will be 10:30 AM Thursday, January 17, 2019 at the Crawford-Marshall Funeral Chapel in Tabor, IA with Pastor Charmayne Harper of the Tabor Congregational United Church of Christ officiating. Visitations will be open after 6:00 PM Wednesday with the family greeting friends from 6:00 to 7:00 PM Wednesday at the Funeral Chapel. Interment will be in the Tabor, IA Cemetery and memorials will go to the Tabor Congregational United Church of Christ or the Tabor Rescue Association. The Crawford-Marshall Funeral Chapel in Tabor, IA is in charge of arrangements. To plant a tree in memory of Kathryn (Bruce) Reeves, please visit our Tribute Store. "Email Address" would like to share the life celebration of Kathryn (Bruce) Reeves. Click on the "link" to go to share a favorite memory or leave a condolence message for the family.